Hurtle and Agnes Tiller were married 3 July 1912 at the Blyth Lutheran Church, South Australia. This newspaper article was published in the Chronicle Newspaper, Adelaide, South Australia, Saturday 03 August 1912, Page 55. Kate is registered on the Midwives Roll for Scotland, 1941, page 331, No. 9211 Willcocks, Kate Florence Louisa. 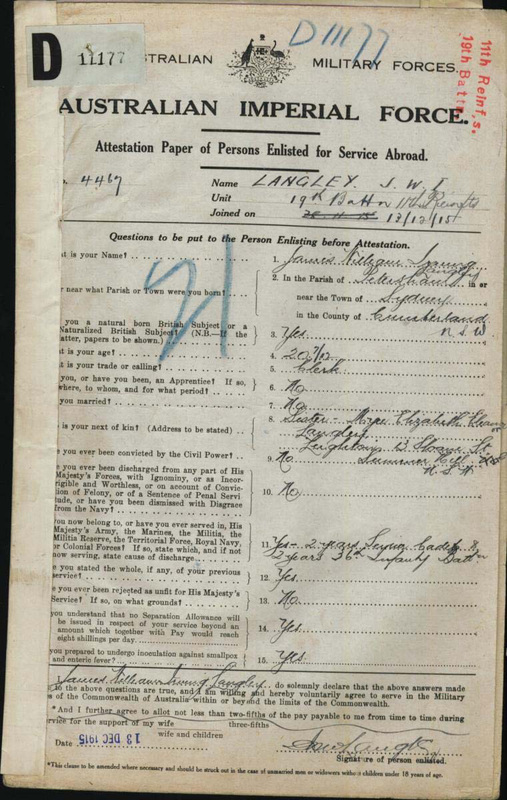 The World War I Australian Army Service Record of Lieut Frederick Charles Gaden. Eliza Duffield, wife of Samuel Bidgood Duffield, Obituary was published in the Western Mail Newspaper, Perth, Western Australia, Australia, Saturday 14 July 1906, page 20. Status: Located; The passenger list of the ship Eliza departed Plymouth to Adelaide 1849. List John and Eliza Tucker and family. The probate of the Late John Scott who died on 03 June 1890 at Fitzroy near Melbourne in the Colony of Victoria. 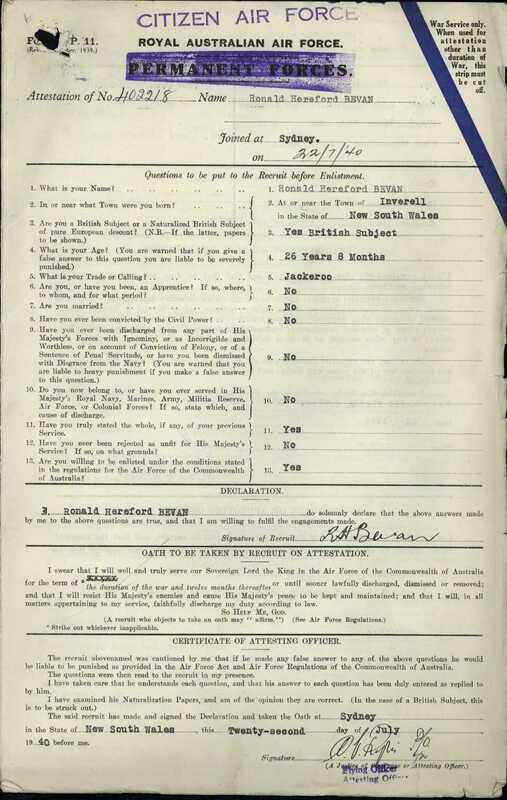 This is the World War II Service Record of Ronald Bevan - He served in the RAAF as a fighter Pilot in 45 Squadron. The Montevideo Maru, Japanese transport, (7,226 tons) was torpedoed and sunk by a U.S. Submarine, U.S.S. Sturgeon, 18.37N, 119, 29E at 3 am on July 1st, 1942, 60 Miles N.W. of Cape Bojidoro, Luzon Island in the Philippines. the ship carried 1, 053 Prisoners of War and Civilian internees from Rabaul - mostly Australians. of the 132 jampanes crew and 88 guards only 17 sailors and three guards reached shore. Transcript of "Remembering 1942 - the sinking of Montevideo Maru 01 July 1942. Presented at the Australian War Memorial by Ian Hodges on Monday 1 July 2002 beside the Roll of Honour at the Australian War memorial. Transcript of 1861 census of England and Wales - Mount Pleasant Farm House - Mary and Sarah Waite. Mary is employed as a Dairy Maid and Sarah is employed as a House Maid. Mary Tucker was employed by Doctor Henry Thompson, Church Street, Faringdon, Berkshire, England as a Housemaid and Domestic Servant. Charles S Campbell was attending school at Powis House, Powis Gardens, Kensington, Middlesex, England at the time of the census. Charles Stanton married Edith Mary Cook in the district of Devizes, Wiltshire England. The marriage was registered July - September 1900, Volume 5A page 0207. This tribute from the Carter and Twoney Families was published in the Advertiser Newspaper 03 June 2015.